Rebuild: Delivers essential nutrients to the interior cortex, nourishing and strengthening strands. Fills in gaps and tears in the damaged cuticle, reconstructing this protective layer to ensure nutrients don‰Ûªt escape. Cements the newly constructed, exterior cuticle to the interior cortex, ensuring hair lays flat. Resurfaces: Seals and reinforces the cuticle layer with a defensive shield that strengthens the strand, increasing resistance to breakage while infusing hair with antioxidants to help prevent free radical and other damage. Restore: Leaves strands fully restored to their healthy, pre-damaged state. Hair is stronger, smoother, softer and shinier. Ideal for dry, damaged hair. Massage throughout wet hair and rinse thouroughly. 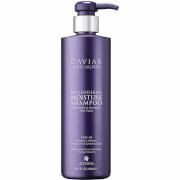 For best results follow with Caviar Repair Conditioner. Seasilk: A blend of marine botanicals that provides exceptional moisture and helps repair damaged hair. Age-Control Complex: Addresses natural, chemical & environmental aging. 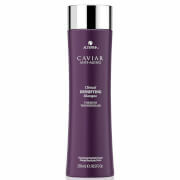 Infused with Caviar Extract and Vitamin C to help smooth the hair strand and increase shine. Enzymetherapy: An exclusive blend of enzymes and minerals designed to help vital nutrients adhere to hair. Water (Aqua), Disodium Laureth Sulfosuccinate, Sodium Lauroyl Methyl Isethionate, Cocamidopropyl Betaine, Sodium Lauroyl Sarcosinate, Cocamidopropyl Hydroxysultaine, Cocamidopropylamine Oxide, Glycol Distearate, Glycereth-26, Hydrolyzed Vegetable Protein PG-Propyl Silanetriol, Caviar Extract, Polysilicone-15, Ascorbic Acid, Superoxide Dismutase, Tocopheryl Acetate, Polyquaternium-7, Hydrolyzed Rice Protein, Butyrospermum Parkii (Shea) Butter, Acrylates/Vinyl Neodecanoate Crosspolymer, Algae Extract, Phospholipids, Helianthus Annuus (Sunflower) Seed Oil, Linum Usitatissimum (Linseed) Seed Oil, Saccharomyces/Magnesium Ferment, Saccharomyces/Copper Ferment, Saccharomyces/Silicon Ferment, Saccharomyces/Zinc Ferment, Saccharomyces/Iron Ferment, C12-13 Pareth-23, C12-13 Pareth-3, Amodimethicone, C11-15 Pareth-7, Laureth-9, Divinyldimethicone/Dimethicone Copolymer, PEG-45M, Glycerin, Decyl Glucoside, Dihydroxypropyl PEG-5 Linoleammonium Chloride, Behenyl/Stearyl Aminopropanediol Esters, Butylene Glycol, Trideceth-12, Aminomethyl Propanol, Hydroxypropyl Guar Hydroxypropyltrimonium Chloride, Citric Acid, Disodium EDTA, Methylchloroisothiazolinone, Methylisothiazolinone, Phenoxyethanol, Fragrance (Parfum), Geraniol, Hexyl Cinnamal, Limonene, Linalool.